3/4" PVC 6 way (an outlet for all 3 planes, in all directions). This is a constructed fitting. Good for construction projects, not good for plumbing projects. 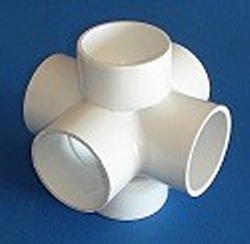 Not a flow through fitting, not an NSF fitting. Custom made part. This is a fabricated fitting, no cancellations, no returns. Ground orders please allow 2-3 extra days for processing. If you need it in a hurry, please use one of the expedited shipping options on the check out page. We will try our best to get it out asap, but large orders may see a 1-2 day delay.